This Santa Fe Gem is a darling 1 bedroom, 1 bath casita on the Historic Eastside of Santa Fe just three blocks to Canyon Road, six blocks to the Plaza, and two blocks to Downtown Subscriptions (adorable coffee shop!). 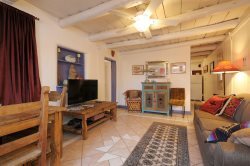 Recently updated open kitchen and bath, this quaint casita retains the charm of old Santa Fe with a fireplace, Mexican tiles, and a private garden patio! The cozy living room opens nicely to the kitchen and eat-in dining area. This hidden jewel is tucked back off Garcia Street. Gorgeous Santa Fe Authentic style condo is in a small quiet compound. Beautiful common area is lush with vegetation. The courtyard is super relaxing! You have full use of the condo, private courtyard, and common area picnic table. I manage multiple vacation rentals and allow you self-check-in at any time after 3:00. I am available all the time by phone, and will meet with you if desired! This condo has a tv for streaming, but is not connected to any tv service! Our idea is for you to escape from the normal life and enjoy peace and tranquility! Candles above fireplace are electric, Please do not light candles. This is a super quiet compound with owner occupants around. We ask that you respect the neighbors' peace of enjoyment but keeping things quiet and low key.